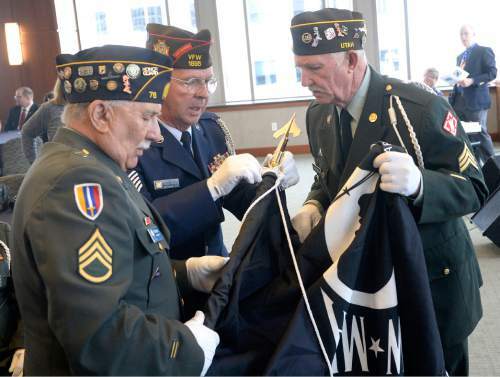 Al Hartmann | The Salt Lake Tribune Honor guard fix POW-MIA flag to pole for flag ceremony for former prisoners of war that were honored Friday April 8 at Utahís annual POW luncheon at the Zions Bank Building in Salt Lake City. The soldiers fought in World War II, Korea and Vietnam. The luncheon is organized by the U.S. Department of Veterans Affairs. 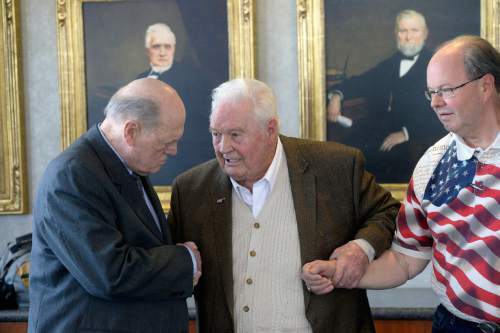 Al Hartmann | The Salt Lake Tribune Charles Howard, an Army POW who served in Korea, left, shakes hands with Robert L. Monson who was an Army Air Corp and POW in World War II, Friday April 8 at Utahís annual POW luncheon at the Zions Bank Building in Salt Lake City. Monson's son Jan, right. Former prisoners of war that fought in World War II, Korea and Vietnam were honored. The luncheon is organized by the U.S. Department of Veterans Affairs. Al Hartmann | The Salt Lake Tribune Air Force Master Sgt. Ted Kampf, left, has a conversation with Air Force Col. Wade Lawrence from Hill Air Force base at Utah's annual POW luncheon Friday April 8. Kampf was a POW in Japan for three years during World War II. The luncheon was organized by the U.S. Department of Veterans Affairs to honor POW's from World War II, Korea, and Vietnam Wars. 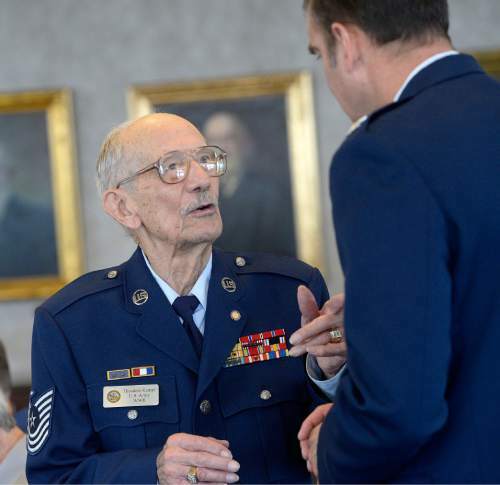 Former prisoners of war were honored Friday at Utah&apos;s annual POW luncheon at the Zions Bank Building in Salt Lake City. The soldiers fought in World War II, Korea and Vietnam. The luncheon is organized by the U.S. Department of Veterans Affairs.